We’re back with another installment of Ask the Home Flooring Pros. This week we address the question of painted floors. We’ve all seen some great results from painted wood floors but can you paint laminate floors? Laminate flooring doesn’t last forever, and when it starts to show wear and tear, the drop-off in its visual appeal can be steep and fast. Is painting a laminate floor an option? You can paint laminate flooring. You can paint anything, we suppose. However, just because you can paint it doesn’t mean it’s a good idea. Our professional recommendation on the subject is that while laminate flooring can be painted with one of the techniques used below, your results might not be very appealing and they probably won’t last very long. When you search this question online, many sites come up that appear to be chock full of flooring made gorgeous through painting. These pages on Pinterest and Houzz are prime examples, and they certainly boast a plethora of pics of beautiful floors. But, upon closer inspection, you’ll see that hardly any of the pictures display laminate painted floors or painted flooring of any kind. Most show laminate, wood, vinyl and other traditional materials. For those who forge ahead with painting their laminate flooring, we’ve outlined the best techniques below. They’ll give you a shot at producing a paint job that lasts long enough to give you some return on your investment of time and money. The “Advice” section on the highly respected This Old House site attracts contractors who enjoy giving answers borne of years of experience. Their answers to the question, “Can I paint laminate flooring?” are worth reading before you forge ahead with the project. For $100-$245, more if you use epoxy, plus a couple days you’ll never get back, you can paint your floor. If the cost isn’t a factor and you enjoy this kind of DIY adventure – meaning one that might not work – then have at it. It’s quite possible you’ll want to pull up the laminate immediately. Or, the flooring might look decent for several months of treating it very gently. On the other hand, many of you will prefer putting the money and time toward the installation of a new flooring. These are the techniques that offer the most promise of success. The Works: Reference.com offers a quick step-by-step laminate floor painting guide that covers all of the basics. The key is to remove the floor’s wear layer, the tough plastic surface which resists paint, to get down to material that will readily accept and hold paint. Let the Sander do the Work: If you’re experienced and careful with the sanding process, it can be used to remove the gloss of the underlying photo rather than using a liquid deglosser. What you want to avoid is going too deep with the sanding, since this has the potential to cause ruts and grooves in the softer materials below. The sand-but-not-degloss approach is the one taken by the folks at Lifehacker. Frankly, it’s the approach we recommend too, but with the caveats we’ve stated throughout. We think that getting rid of the plastic wear layer and getting down to wood before painting gives the paint a much better chance of sticking when something scrapes across it. Skip the sanding completely: There’s a bit of controversy (Oh, my! ), about whether the floor first needs to be sanded. For example, the namesake of Lisa’s Creative Designs goes right to the primer step after “a quick sweeping,” as she describes on her blog. Lisa’s post, one of only a few on the mentioned Pinterest page actually about this topic, is quite chatty and contains her photo documentary (she took a lot of pictures) of the project. She’s an experienced DIY homeowner, and we think you’ll benefit from her description of the real-life issues you’ll face as you prepare and paint your floor. Yes, you can. Now, having given our thoughts on the matter, we leave it to you to decide whether what can be done should be done. I am interested in a house that has brand new laminate throughout, which would be fine except I hate the color. What is my best option other than carpet? Area Rugs. They come in all sizes, designes, modern, traditional, western (etc.). I recomend wool because they will last (if vacuumed and cleaned properly a lifetime) at least 20 years. Some object to wool and prefer synthetic but I say: If you can wash the dog you can spot clean wool a natural animal product. Most stains are removed easily. Get the rugs and change the look of those laminate floors. 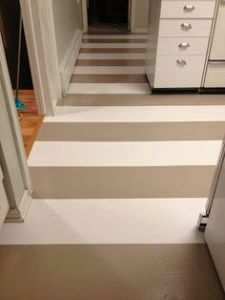 Try one in your entry or family room the floor color will fade into the background!! If you use Zinsser BIN which is a fast drying shellac primer and adheres very strongly to pretty much everything WITHOUT sanding, then there’s no reason why painting laminate flooring can’t be both successful AND enduring. I’d advise using an oil based paint as they are very hard wearing, unless you are going for the white look, in which case I’d suggest researching the toughest water-based white paint available (oil based white paints tend yellow quite quickly which is why I advised avoiding those). Anyone have comments on Bluelinx Country Home Collections 235004 Plymouth Maple 8mm Laminate Flooring. Comments would be very appreciated. My grandmother cooked for 12 hired hands on her farm. For the first 10 years, they had painted floors in the kitchen. Two sittings every meal. Men in boots for first sitting, family (8 kids eventually) for second sitting. Floor was swept 3 times a day, and washed while the bread was baking in the morning every day. They repainted every fall. Later, you could buy vinyl flooring from Sears. They did that, and it too was beat up enough to need replacing every fall. I have a painted staircase. It gets a lot of traffic by us and by the dogs. After 4 years, it’s time to redo it. When questions like this come up, there are usually a lot of responses from contractors, and people in the flooring business to the effect that this would be your worst mistake and it will cost you much more in the long run. That’s most likely nonsense since the most you have at risk is the cost of the (admittedly fairly expensive) paint and whatever time you invest. If that doesn’t work, you’ll have to replace or somehow cover the floor, which you’d have to have done anyway. I can definitely understand why contractors don’t want to do anything that’s not by the book, since any experimentation will involve expensive re-visits for them. And the building materials industry is committed to the notion that things like vinyl siding and laminate floors must always be replaced; that’s part of the business model that makes them profitable, a little like “one use” contact lenses that are not much different from the ones that last longer, but priced lower as part of a subscription plan. They have their priorities, you have yours. As a DIYer, you can test out a method in a small area, fix minor mishaps, and make tweaks to your plan that would cost a contractor hundreds of dollars in travel time, so you have less at risk. If you want your laminate floor painted, look for examples of people who have done it successfully and had it last a reasonable period of time, or had success in whatever touch-ups were needed; as long as it doesn’t peel, a little wear here and there won’t be a big deal. From the anecdotes I’ve read, the basic requirements are the roughing up of the wear layer (though total removal is not needed) and the use of expensive epoxy paint (though cheaper paint may adhere to that, if needed). I don’t have laminate floors, but if I did, I’d risk a “painting disaster” if it held the possibility of getting a decent finish without having my floors torn up.